NASA research of earth-moon mechanics by late astrophysicist Robert Newton leads MSU mathematicians to a breakthrough in the chronology and history of ancient Greece. ‘The Issue with Troy’ shows the amazed reader that the whole Troy story was a swindle exercised by German ‘archaeologist ‘adventurer Schlieman. Dr Fomenko follows Sir Isaac Newton ideas in “The Chronology of Ancient Kingdoms Amended” and applies Occam’s razor (among competing hypotheses, the one with the fewest assumptions should be selected) and concludes that Homer’s history of Troy is pure fiction. Indeed, today`s consensual localization for Homer’s Troy is a village Hisarlik near the Hellespont straits. Herr Heinrich Schliemann solemnly baptized as “Troy” a 100 by 100-metre excavation site in a minuscule ancient settlement (such ruins do abound there). Subsequently, he publicly announced the finding of gold of Priam artefacts. The ‘”ancient” treasures found “miraculously” he designed himself and manufactured by Paris jewellers Bulgari. Schliemann’s made lots of noise about his earthshattering discovery, therefore was sued by the Ottoman government, lost his case, paid the fine of 400 pound-sterling and sold the Priam`s treasure at a hefty profit to a state museum in Berlin in 1881. Germans boasted about the Priam`s treasure till 1945 when Russians have confiscated it as spoils of WWII. Schliemann’s excavation method of nine levels of archaeological remains with dynamite was highly productive for the rapid finding of artefacts and utterly constructive for supporting Homer’s Iliad myth but totally destructive for any real significant historical artefacts, including the level presumed to be the historical Troy. 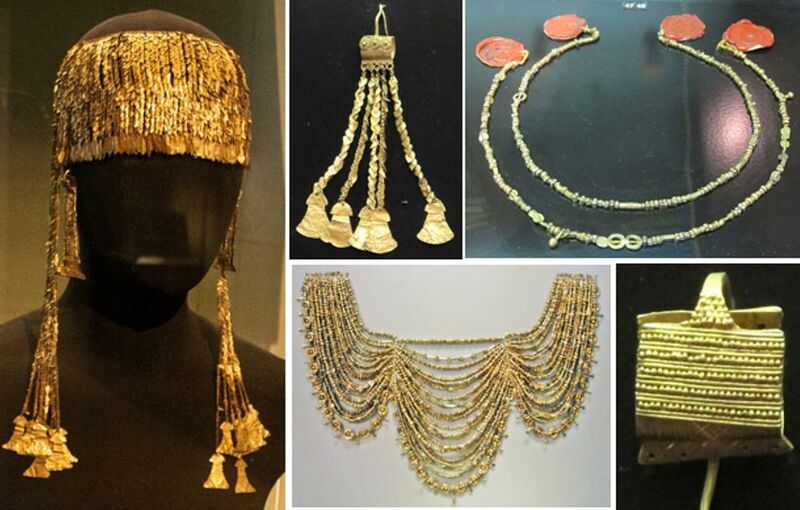 Admire the Priam`s treasure trinkets located in the Pushkin Museum in Moscow!